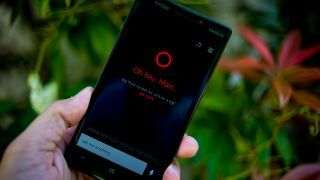 Not even the Halo universe is immune from this tough economic climate, so Cortana has taken a second job as Windows Phone's voice assistant - though only for people living in the US right now. But she's on her way to Britain, and Microsoft has confirmed that the developer preview is less than two weeks away. Responding to someone on Twitter, Marcus Ash, Group Program Manager of Cortana, said: "Barring an unforeseen issue, down to less than 2 weeks for the developer preview." So long as Cortana has managed to get her head around the important difference between American and British "chips", we should see her here in less than a fortnight. Microsoft has been teasing a UK launch since May, but it sounds like the launch was pushed back by a few weeks. Ash said it was a "tough project" but confirmed that Cortana will be putting on her best British accent when she arrives.